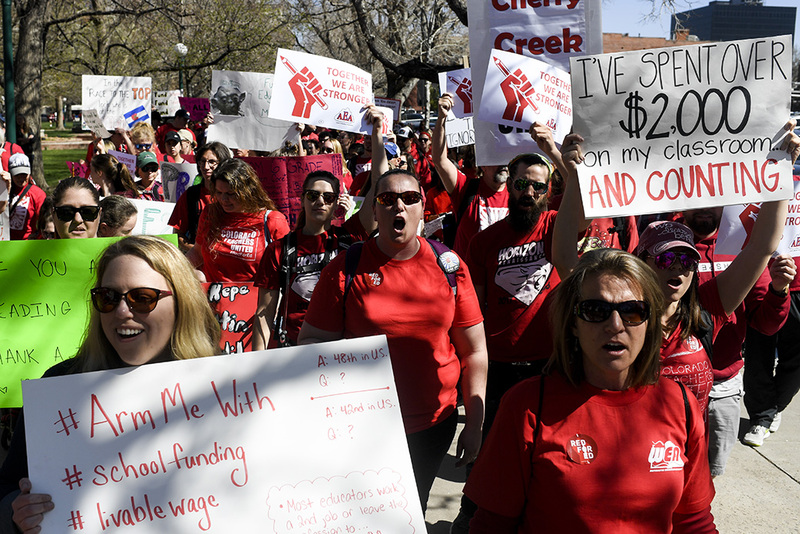 Teachers don red and march around the capitol grounds en masse during a teachers rally for more educational funding at the Colorado State Capitol, April 27, 2018. Because teachers’ compensation should reflect the importance of their work, CAP proposes a $10,000 federal Teacher Tax Credit that would increase pay for eligible teachers in high-poverty schools. In 1997, Megan Doerr began her teaching career as a kindergarten teacher in a low-income elementary school in Minnesota. She was making $25,000 per year and was riddled with student loan debt. In fact, she, as a college graduate, was making less than her mechanic fiancé, who did not have a degree. She soon realized two things: She needed more training and resources to meet the complex needs of her 5-year-old students, and she would have to find ways to boost her salary to pay the bills. Twenty years later, Megan is now a single mom to a 16-year-old son and still teaches at the same school. She says that as a Korean American woman adopted as an infant, she loves that she’s able to work with children from various cultures and backgrounds, and she draws on her own upbringing to connect with her students, who are ethnically, racially, and linguistically diverse. This year, she has maxed out her earning potential on the steps-and-lanes pay schedule, so she will not see another a pay bump apart from a possible biannual cost of living adjustment unless she seeks a doctoral degree. With no pay increases on the horizon and new bills to pay as she plans to buy her first home this fall, she is looking to take on additional work to maintain her current budget—a significant portion of which is dedicated to not only her son but also all the children she teaches. Megan’s emotional and financial commitment to her students and classroom reflects the weight of her responsibilities and is emblematic of teachers’ experiences across the United States. Teachers are responsible for educating and cultivating today’s students—the future of the U.S. democracy and workforce. By 2020, 65 percent of all jobs in the United States will require postsecondary education or training.2 To be prepared for democratic participation and postsecondary education, students need a strong base in elementary and secondary school, with excellent, meaningfully supported educators in their classrooms. Currently, teacher compensation does not align with the critical role that educators play in building and sustaining the nation’s democracy and middle class. Teacher compensation in high-needs schools and districts is especially problematic. High-poverty school districts are more likely to be underfunded and lack the resources that educators need to be successful.4 Moreover, students in high-poverty schools need additional academic support for a number of reasons, such as lack of access to high-quality early education, to ensure that they are on a level playing field with their more affluent peers.5 This places additional responsibilities and stress on a teacher’s already full plate. Yet on average, teachers in schools serving low-income students earn less than teachers in schools serving high-income students. While these differences are largely driven by classroom experience and degree attainment, it is still important to recognize the real gap between average salaries in different school contexts.6 More specifically, in the 2015-16 school year, the average salary of teachers in the highest-poverty schools was approximately $4,000 less than that of teachers in the lowest-poverty schools.7 The gap between these two school types is important context for the labor markets surrounding both high-poverty and low-poverty schools. This report outlines a first-of-its-kind proposal for the federal government to help dramatically increase teacher compensation in high-poverty schools. The Center for American Progress proposes that the federal government offer an annual $10,000 refundable Teacher Tax Credit to elementary and secondary teachers in schools serving high percentages of students eligible for free or reduced-price lunch. Increasing teacher pay has the potential to make teaching more attractive and entice effective, diverse candidates to enter and remain in the profession and thereby increase student outcomes. Research shows that teacher pay is a significant factor in an individual’s decision to enter and remain in the teaching profession. The national think tank Third Way surveyed current college students, and 89 percent of respondents reported that “salary for those established in the career,” not only starting salary, was an important factor in selecting a job.31 Many college graduates seek more lucrative job prospects than teaching. Moreover, teacher turnover has a measurable negative impact on school stability, student achievement, and districts’ budgets.35 Further, turnover is highest in high-poverty schools, and underserved students are more likely to experience teacher turnover or churn.36 With greater churn, there is a continual rotating door of experienced teachers exiting the profession or leaving the school. Each of these moves is more likely to result in less-experienced teachers taking their place. A recent study found that high teacher turnover within a school not only affects the students in the classrooms with inexperienced teachers but also negatively influences schoolwide achievement levels.37 In other words, when a teacher quits, the entire student population absorbs the impact. Recruiting, hiring, and training new teachers is time-consuming and costly for districts. In fact, the Learning Policy Institute estimates that urban districts spend more than $20,000 to replace a single teacher.38 Increasing the tenure of teachers’ service increases the return on districts’ investments in those teachers.39 Finding solutions to reduce turnover by addressing the reasons some teachers leave the profession will improve retention within the teacher workforce and increase student achievement. These solutions may also pay for themselves by freeing up dollars from new hiring efforts. Relatedly, increases in teacher pay may not only reduce teacher turnover. Research shows that higher salaries also influence the quality of a districts’ applicant pool.40 A study in the San Francisco Unified School District found that an increase in pay can increase a school’s attractiveness in a local labor market—and by doing so increase the size and the quality of the applicant pool.41 After a salary increase, newly hired teachers in the district increased student gains for English language arts compared with cohorts of newly hired teachers in previous years.42 It is therefore reasonable to think that a long-term investment would have substantial, long-term impacts on both the size and quality of the applicant pool and the characteristics of teachers continuing to teach in a district with this type of pay increase. To the extent that this debt burden is an obstacle to increasing teacher diversity, increasing pay in these schools will likely contribute to the recruitment and retention of teachers of color—and in turn, positively affect student outcomes. 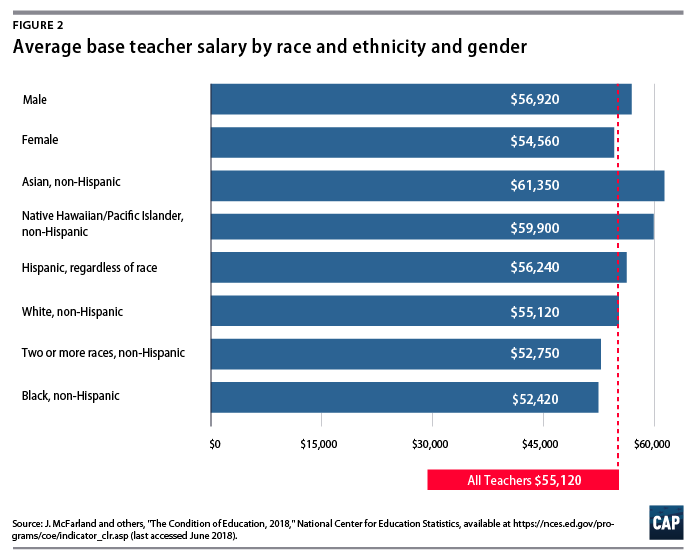 There are also important differences in average pay by teacher race and ethnicity. In part, these differences are likely due to unequal demographic distributions in high-poverty versus low-poverty schools. According to 2015-16 school year data,50 black teachers comprise slightly less than 3 percent of teachers in schools where 34 percent of students or less receive FRPL, but they comprise slightly less than 13 percent of teachers in schools where 75 percent or more students receive FRPL. 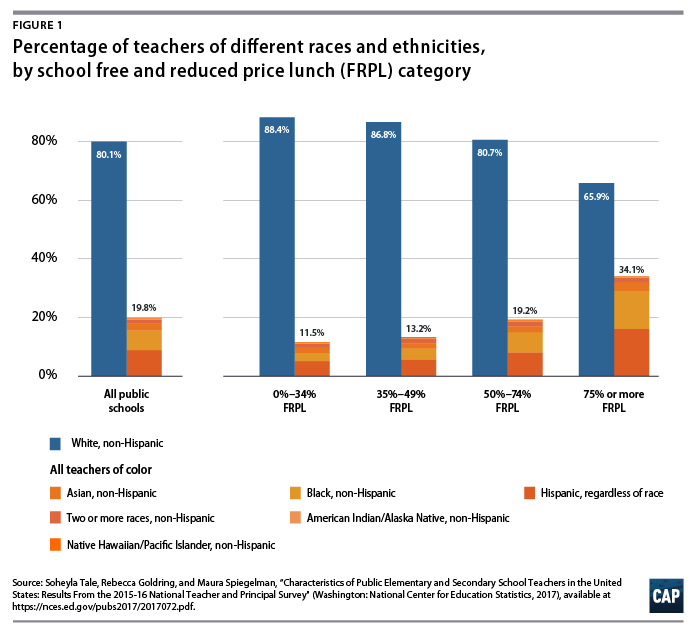 Similarly, Hispanic teachers make up only 5 percent of the teacher workforce in schools where 34 percent of students or less receive FRPL, but they make up 16 percent of all teachers in schools where 75 percent of students or more receive FRPL. Indeed, while differences in pay are largely driven by experience and degrees, it is nonetheless important to note that on average, black teachers earn $2,700 less per year than white teachers. Further, the average salary of female teachers is more than $2,000 less than that of male teachers—$54,560 and $56,920, respectively.51 Importantly, recent research shows that even when controlling for degrees and experience, female teachers earn less than male teachers and black teachers are paid less than white teachers.52 Given these discrepancies, increasing pay for teachers in high-poverty schools has the potential to ameliorate concerning inequities in pay by race and ethnicity and gender in the teaching profession. A different approach is needed to meaningfully improve the teaching profession and thus student outcomes. Other high-performing countries pay teachers considerably more than the United States, and some of these have implemented a national strategy to increase teacher salaries.58 Singapore helps maintain adequate teacher salaries by certifying that they align with the compensation awarded to other similarly educated professionals.59 Faced with massive teacher shortages, the United Kingdom increased teacher pay, funded national recruitment efforts, and improved teachers’ working conditions.60 These international models have proven successful in addressing teacher quality—and by doing so, the quality of the education system. Like the governments of other high-performing countries, the U.S. government should act to protect and increase teacher compensation, especially for teachers in high-poverty schools. There is a precedent for federal investment in specific professions. For example, the federal government spends more than $15 billion annually on graduate medical education to support the development of the health workforce.62 Just as doctors are critically important to the health and well-being of the population, teachers are vital to the prosperity and well-being of the U.S. population. According to Megan, this boost in pay would ensure that she could save for her son’s college and maintain savings for home repairs while still being able to afford to give her students the experiences and resources that are out of their reach. Megan said it pains her to send notes home to parents about field trips, knowing that they cannot afford to send their children when they cannot afford to put clothes on their children’s backs. Megan said she would use the extra money from the tax credit to provide her kids with experiences that they currently cannot get anywhere else. The full tax credit would be directed toward teachers in high-poverty schools—defined as schools where 75 percent of students or more receive free or reduced-priced lunch. The tax credit would then phase out as the percentage of students receiving free or reduced-price lunch declines, in order to avoid a cliff effect where teachers completely lose the credit as soon as the number of FRPL students falls below the 75 percent threshold. The phase out will also address any unintended consequences caused by instability in FRPL rates across years. The value of the tax credit would decline by $400 for each percentage point, from 74 percent FRPL to 50 percent FRPL. So, for example, teachers in schools with 74 percent FRPL would receive a $9,600 tax credit. This investment would help attract more teacher candidates to high-poverty schools, as well as retain experienced educators in high-poverty schools. Investing in teachers in high-poverty schools helps teachers afford to teach in the schools with the greatest need and would increase the economic stability of teachers’ communities. It also sends the message to students in those schools that they are worthy and deserving of an experienced, well-paid, meaningfully supported teacher workforce. Ensuring that today’s students have high-quality teachers could change the trajectory of their lives and pave the way for a stronger future workforce. The value of the tax credit—$10,000 per teacher per year—is set to close the gap between teacher salary and the average salary of all college graduates.67 A National Center for Education Statistics study also reinforces the need for this value, finding that a $20,000 pay increase over two years—meaning a boost of $10,000 per year for two years—successfully incentivized teachers in 10 different school districts to transfer to high-poverty schools and minimized turnover for those two years.68 The majority of research on the ability of financial incentives to redistribute teachers focuses on pay-for-performance or loan forgiveness policies—which are inherently different than this proposal, which increases base salary. This research shows that pay increases must be significant to influence teachers’ decisions and are most effective when coupled with policies to improve working conditions and increase teacher supports.69 Because this proposal is structured as a tax credit, all qualifying teachers would receive the full value of the tax benefit through a dollar-for-dollar reduction in the taxes they owe and a tax refund to the extent that the credit exceeds the taxes they owe. The goal of supplementing the pay of those who teach in high-needs schools could be addressed through an explicit spending program administered exclusively by the U.S. Department of Education. But providing the supplement through the federal tax code has distinct and important advantages. A federal tax credit is a simple, well-suited tool for supplementing the income of teachers in low-income schools. Indeed, increasing the pay of teachers serving in high-needs schools should be a national priority, but state and local policymakers alone cannot address this issue uniformly. Thus, increasing pay for teachers in high-needs schools through the federal tax code is a fundamental step toward the national goal of reducing poverty and boosting the economy. Because a tax credit would be stable, it could be a real and significant factor influencing teachers’ long-term decisions about whether and where to teach. States and districts would have an incentive to include the information about this tax credit in their recruitment materials to increase the number of applicants to high-poverty schools, which are likely to have greater turnover and less experienced teachers. A tax credit also would complement existing federal policy that supplements state and local dollars to improve instruction for students enrolled in high-needs schools. Title I of the Every Student Succeeds Act (ESSA) provides schools with additional funding to serve students from low-income families.72 Schools with at least 40 percent of students in poverty may spend the additional dollars to improve their overall education program, including hiring additional teachers or guidance counselors to provide supplemental services or to reduce class sizes.73 The tax credit would increase the compensation of the teacher positions in high-poverty schools in the local labor market. While CAP believes that a new federal investment is necessary to dramatically improve teacher pay, other efforts at the federal, state, and local levels are essential to maximize compensation for all teachers. This proposal is intended to operate in tandem with existing policies to increase teacher pay—and should not replace or supplant existing policies. Because the tax credit will increase pay differently within districts and salary schedules are set districtwide for the vast majority of teachers, states and districts will not be able to use this proposal to supplant other initiatives to increase teacher pay. Federal legislation should also provide protections to ensure that states and districts maintain and increase their investment in teacher salaries. This may include an assurance that districts with teachers eligible for this tax credit do not lower salaries, public reporting of teacher salary, and descriptions for how states plan to leverage the Teacher Tax Credit to improve instruction in high-poverty schools. Teachers earn far less than other professionals with similar levels of education, and the impact of this wage gap is far-reaching: Teachers struggle to provide for their families; the profession loses top talent to higher-paying careers; and students, especially those in high-poverty schools, experience high teacher turnover. Taken together, these consequences have a negative effect on the strength, stability, and diversity of a critical portion of today’s workforce and will influence the life outcomes of tomorrow’s. Certainly, salary considerations and working conditions influence teachers’ decisions on whether to leave the classroom, and policymakers should implement policies that modernize the teaching profession across the entire teacher pipeline. Other high-performing countries have implemented systemic changes to increase teacher pay, recognizing its interconnectedness to improving teacher quality, recruiting a diverse teacher workforce, improving student outcomes, and promoting economic and cultural prosperity. A similar response is needed in the United States. This report demonstrates that an increase in pay for teachers in high-needs schools will lessen pay inequities, reduce teacher turnover, and support efforts to increase teacher diversity—and by doing so, will increase overall student achievement. This investment in the teacher workforce will also increase teachers’ earning potential and help rebuild a prosperous middle class. The federal government should take action to boost the pay of teachers in public elementary and secondary schools, especially for teachers such as Megan who work in high-poverty schools and too often must choose between caring for themselves and caring for their students. Meg Benner is a senior consultant at the Center for American Progress. Previously, she was a senior director at Leadership for Educational Equity. Benner worked on Capitol Hill as an education policy adviser for the House Committee on Education and the Workforce, where she advised former Ranking Member George Miller (D-CA) and served as a legislative assistant for Sen. Richard Blumenthal (D-CT) and former Sen. Christopher Dodd (D-CT). She received her undergraduate degree in American studies from Georgetown University and a master’s degree of science in teaching from Pace University. Erin Roth is a senior policy analyst for education innovation at the Center. Previously, Roth served as the early childhood education research alliance lead at the American Institutes for Research, which supports education policy and research needs in seven Midwestern states through the Regional Educational Laboratory Midwest—funded by the U.S. Department of Education’s Institute of Education Sciences. Roth received her bachelor’s degree from the University of North Carolina at Chapel Hill and a master’s degree in sociology of education, education policy from New York University. Stephenie Johnson is a senior consultant and formerly the associate campaign director of K-12 Education at the Center. In this capacity, she researches, develops, and writes policy recommendations aimed at elevating the teaching profession. Before coming to the Center, Johnson completed the Social Policy & Politics fellowship at Third Way, a think tank in Washington, D.C. She is also a former fifth-grade teacher. Johnson earned her J.D. and M.Ed. from Boston College and her B.A. in political science from Rhodes College. Kate Bahn is an economist at the Washington Center for Equitable Growth. Her areas of research include gender, race, and ethnicity in the labor market, care work, and monopsonistic labor markets. Previously, she was an economist at the Center for American Progress. Bahn also serves as the executive vice president and secretary for the International Association for Feminist Economics. She has published popular economics writing for a variety of publications, including The Guardian, The Nation, Salon, and Newsweek. She received her doctorate in economics from the New School for Social Research and her bachelor of arts from Hampshire College. The authors wish to acknowledge several people who helped with this report. Catherine Brown, vice president of Education Policy at the Center for American Progress, helped develop the idea and provided invaluable feedback throughout the process. Lisette Partelow, director of K-12 Strategic Initiatives at the Center, helped structure the report. Alex Thornton, senior director of Tax Policy, provided critical feedback on the structure of the tax credit. We appreciate Megan Doerr’s willingness to let CAP tell her story. Thanks to peer reviewers for their feedback to strengthen the narrative and recommendation, including: Megan Allen, director of Partnerships at the National Network of State Teachers of the Year; Katherine Bassett, former president and CEO of the National Network of State Teachers of the Year; Ninive Calegari, CEO and founder of the Teacher Salary Project; Jessica Cardichon, director of Federal Policy at the Learning Policy Institute; Simone Hardeman-Jones, national director of Policy at Partnerships at Educators for Excellence; Tamara Hiler, deputy director of education at Third Way; Eric Isselhardt, senior executive at the National Network of State Teachers of the Year; Bethany Little; principal at EducationCounsel; Mildred Otero, vice president of Policy and Advocacy at Leadership for Educational Equity; Melissa Tooley, director of PreK-12 Educator Quality at New America, and Vanessa Williamson, a fellow in Governance Studies at the Brookings Institution. The authors would also like to thank Sean Corcoran, associate professor of economics and education policy at New York University (NYU) Steinhardt, affiliated faculty of the Robert F. Wagner Graduate School of Public Service, and associate director of NYU’s Institute for Education and Social Policy, as well as Dorothy Jean Cratty, an independent consultant who reviewed the original analysis and strengthened the framing and interpretation of the conclusions.